our credit card to pay for electricity and telephone bills"
If something costs $4 and you only have $3, you can not afford to purchase that item unless someone gives you a dollar, loans you a dollar or you earn an extra dollar. If you borrow that $1 the lender is going to want it back in the future with interest. Continuing to purchase with borrowed money it is called deficit financing. 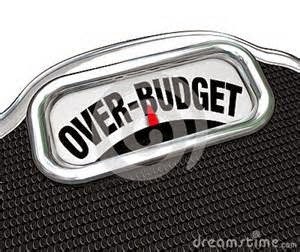 The average household can only do that for so long before revenues are eclipsed by expenditures. Your earnings can not pay the bills. You have to learn to live within your means. That means spending only what you take in and knowing what you can afford. When you get out of hock, you might want to save for a rainy day so you do not have to go putting yourself back in debt. In 2003, the Progressive Conservatives inherited a $914 million dollar deficit. The total debt of the province was nearly $12 Billion. The provincial budget was $4.2 Billion and nearly a quarter of that went to financing the debt. The government promised that it would, on a on a go-forward basis "regain control of our expenditures over a reasonable time frame"
Than suddenly, the price of oil sky-rocked. Revenues from our non-renewable resources increased substantially, the time limited Atlantic Accord Offsets increased our fiscal capacity to spend and the structural problems with our budget and indebtedness as identified by the infamous independent PricewaterhouseCoopers report , "Directions, Choices and Tough Choices", were all but forgotten. A decade later provincial expenses are 58 per cent higher and the net debt is near $10 billion and climbing. 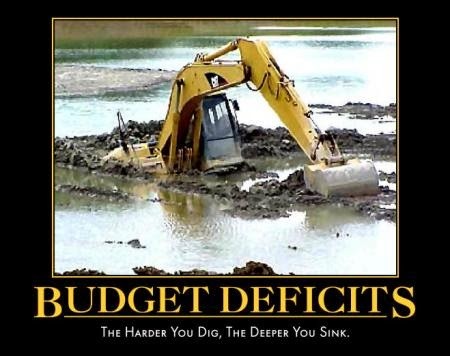 Yesterday, the Minister of Finance admitted that this years deficit, the third in a row, will soar to nearly a BILLION Dollars for the fiscal year 2014-15. Consecutive Auditor Generals warned the government that the reliance on oil prices staying high and increased expenditures were a recipe for financial disaster. They were scoffed at. The belief in the lasting power of high oil also fostered the belief that the Lower Churchill's untapped potential could provide cheap renewable energy for American markets. Billions of dollars accumulated in the surplus years was siphoned from the public purse to NALCOR to fund the project. Unfortunately, we have learned that neither of the twin assumptions held up to the test of a third term in government. Hydro-electricity from the Lower Churchill will not be cheaper than non-renewable gas turbines (at least not in the foreseeable future) and cementing our economic future around a new staple - high priced oil, was a mistake. They forgot their promises to make decisions for the right reasons – not for political reasons. 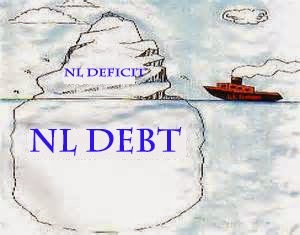 They failed to generate new industries, diversify the economy and save for those "rainy days"
An opportunity to turn the tide in Newfoundland and Labrador and chart a new course to prosperity and self reliance has been lost. The only unknown is if there is a political leader in this province who can offer us a way forward, who can find a way to to bring spending in line with revenues. It is worst than all that, Peter..
Interest rates on sovereign debt have been kept to historic lows through massive intervention in the bond markets by central banks. Even so, we spend nearly $1 Billion in interest payments on debt. In the meantime, our debt levels are very likely to close to double within the next five years. So if all other things are equal, interest payments go to $2 Billion. In the highly likely scenario that interest rates eventually go to normal levels - approximately double current rates - our interest payments go far higher as we turn over the debt. In total it is possible that payments on the debt could slowly march up to $4 Billion - that's out of a $7.8 Billion budget! Two billion is interest payments is entirely likely and conservative.. Meanwhile, we have to consider the irresistible cost associated with our rapidly aging population, most of whom live in totally unproductive rural areas - who know, the ones with ferries to no where and the like. All told, health care costs are likely to double within the next five to ten years.. It is like this, unless oil prices march right back up to $110, "Houston, we have a problem!!" We can buy some time with a 10% across the board wage cut, an orderly reduction in the civil service through attrition, an immediate 5% layoff, and mothballing Muskrat Falls. This is one puppy who sees the writing on the wall. There has to be a job up north in some remote community where pensions are transferable... I believe so. I am leaving the sinking ship. It is too risky to stay. Can me a rat if you like. I don't care! !